When RSCJ make their perpetual profession of vows they receive a cross to wear. Although the cross has become simpler and smaller since Vatican II it still contains the same insignia and words as the one worn by professed RSCJ since our foundation. 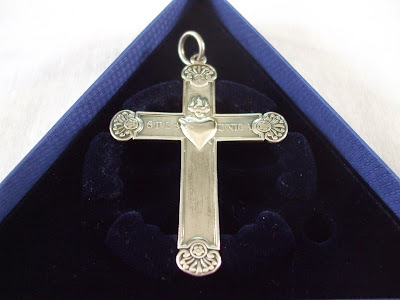 Though many RSCJ receive a new profession cross some receive one which has been handed down - mine, for example, had previously belonged to a sister with whom I had lived for three years, who died while I was preparing for my profession. When we gathered in June to celebrate the feast of the Sacred Heart we discovered that our Archivist General had brought a special cross with her from Rome, one with an inspiring and touching pedigree. It was first worn by St Philippine Duchesne, our first missionary and second saint, who received it from her good friend, our founder St Madeleine Sophie Barat. In 1818 Philippine took the Society to pioneer territory in the USA. In 1852 as she lay dying Anna du Rousier arrived from France, en route to Chile, to begin our first Latin American foundation. She and Philippine exchanged profession crosses, and so Philippine's cross went with Anna on the long, arduous journey to a new land. In 1879 a French religious brought her cross back to Europe, and in 1901 Mabel Digby, then Superior General, gave it to Janet Stuart, who wore it for the rest of her life. After her death it went to our archives, where it became known as the missionaries' cross. It may well have spent the past century resting in a box, but with its worn insignia and mottos it bears the imprint of the hundred or so years it spent in active service before then. This is a cross which spent two months being battered by Atlantic winds and sprayed with salty water as it crossed the ocean in 1818. Year after year it endured primitive conditions, mud and extremes of weather - bitter winter frosts and melting summer heat. And then with Anna it trekked for months across Latin America in pre-Panama Canal times, being bounced and thrown about each time her horse stumbled or she fell. I wonder, too, how many times it was clasped in times of crisis or difficulty, maybe by hands damp with sweat or tears, providing a welcome reassurance of God's faithful love and presence? So much prayer, suffering, passion and endeavour is ingrained in this cross, as surely as the insignia and mottos engraved on it. Since that feast day Mass at the end of June the missionaries' cross has been in England. It accompanied us to High Leigh for the Janet Stuart conference, where it occupied a place of honour in the lecture hall, visited our infirmary community then was securely locked away. But tomorrow it returns to Digby Stuart College Chapel, where it will be brought up to the altar during the Eucharist of thanksgiving with which we end the Janet Stuart centenary celebrations. With it will come the spirits of the great women who have worn it; great-hearted women of passion, faith and prayer, who gave their lives totally to God and the Society's mission around the world. May they inspire us and pray for us that we can be and do likewise. Thank you Silvana. This is very powerful.